Purefecto: New Jeff Koon Balloon Dog! New Jeff Koon Balloon Dog! If you have been following Jeff Koon's limited edition artwork, then surely you know of balloon dog plates that were published by MOCA back in 2002. I remember seeing the dog plates in red and blue and didn't think much of them. I believe they were asking $595 each. Well, unfortunately for me, I did not stock up on those plates (more like I didn't get any). Today, those balloon dog plates regularly sells for $16,000-$20,000. Pretty good investment if you ask me! 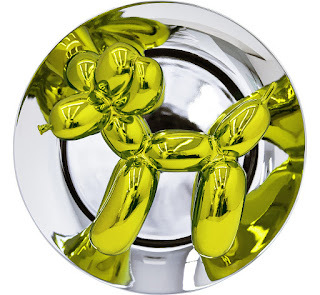 MOCA together with Jeff Koons had decided to publish a different color balloon dog plate recently (all net proceeds will be dedicated to MOCA's endowment). This time in yellow. Unfortunately the price is no longer $595....Now it's a princely sum of $8,000. I guess that's still a bargain considering red or blue dog plates routinely sells for $16,000 and up. So for those readers with deep pockets, you may want to buy up these "cheap" plates since I'm sure once they are sold out, you will start to see them popping up at Christie's or Sotheby's for $16,000 and up. One per customer per MOCA website. Start to get your aunt Betty and nephew John calling MOCA. LOL.